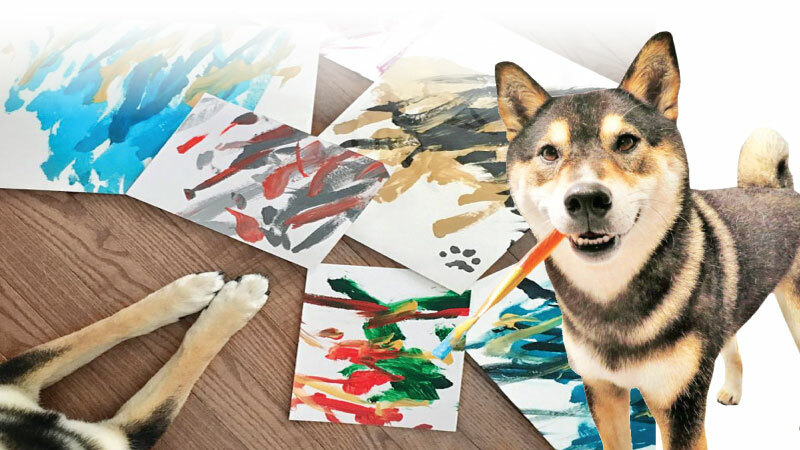 This loveable pup is a real-life Pawcasso, as he has amassed thousands of dollars from painting a series of abstract masterpieces. Hunter, a cute Shiba Inu, creates amazing works at his home in Alberta, Canada, having been taught by his owners, Kenny Au and his wife, Denise Lo. The works created by five-year-old Hunter would look right at home in a modern art gallery, and to date the pooch has sold more than 150 paintings. The couple started painting with Hunter in March 2017 – but initially this was simply a mental enrichment exercise for the dog. In need of artworks for their walls, Kenny and Denise decided to teach Hunter how to create such works, having already taken him to the likes of agility classes and taught him how to clean up after himself. Amazed at how well the initial paintings turned out, the couple decided to continue working with their beloved dog to create more works.Each painting session take between 10 to 15 minutes, the couple said, and the final works sell for around £43 each. Going forward, Kenny and Denise plan to take things day by day, as well as working with more rescue organisations by donating some of Hunter’s works for sale. Kenny added, “We’ve seen a lot of support for Hunter from everyone over the past couple of years. We love seeing the memes and reading the fan mail that Hunter gets.